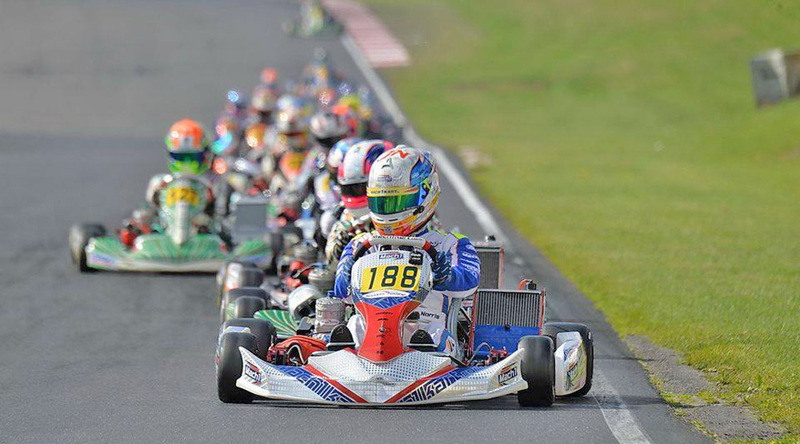 Mach1 Motorsport and their drivers John Norris and Harrison Newey met the world elite of kart racing at the finale of the CIK-FIA KF European Championship in England. The duo knew how to impress with their great performances, even under very alternating weather conditions. The German chassis manufacturer is very well prepared for the second half of the season. While Mach1 and John Norris are a constant at the European shifterkart Championship and just barely missed winning in Wackersdorf, coming in second, the team now took a side trip to the finale of the KF European Championship on the PFi International Circuit in Brandon. Due to fast bends, two chicanes and a tunnel as well as a bridge, the 1.382m long track held some special challenges for the drivers.”The setup of the chassis is especially important to gain enough speed on the long straight passages”, said team leader Martin Hetschel. Under alternating conditions, the Thursday was used to break in the engines. Things got serious on Friday then. The duo was able to get used to the track until qualifying and impressed early due to quick lap times. But right on time for qualifying rain set in and turned the whole morning’s work upside down. Harrison Newey didn’t catch a perfect lap and only ranked 40th in the end. Things went considerably better for his team mate from Ireland. Also on the wet track for the first time, John ended up on the impressive fifth starting position. “Unfortunately I had to overtake someone during my fastest lap, otherwise I probably could have been even faster”, he commented on qualifying. “But considering the fact that I’m on the track with Dunlop rain tires for the first time, I’m very content”, continued Norris. On Saturday the four heats took place. John knew how to use his perfect starting position and already impressed everyone during the first heat by driving the fastest lap. Unfortunately an engine problem and a racing accident that wasn’t his fault cost him important positions as well. “If these annoying incidents hadn’t happened, we surely would have been able to qualify for the pre-finale among the top ten. It’s still a top performance considering that I’m in a KF kart for the first time since the DKM finale in Genk”, said John on Saturday evening. It was a lot harder for his team mate due to his bad starting position. He had to fight his way forward from the back of the field during all four heats. Due to a falling out during the last heat he was on the overall 40th position in the evening and had to enter the repechage from 12th place. Both drivers started into the racing day highly motivated on Sunday. While John had already qualified for the finals, Harrison still had to fight for his final ticket during the repechage. Due to the high power density he wasn’t able to enter the final races in the end though. “That’s extremely unfortunate, because with my repechage’s lap times I would have been able to drive among the top five at the pre-finale and final races”, said Harrison. John improved his performance during the pre-finale and gained six positions, coming in on the great 12th place. Regarding the finale, the Irishman had set himself the goal of ending up among the top ten. At the finale, the race was over after just four laps though. John was ungently pushed into the off and had to end the race prematurely. “Continuing the race in this kart was not possible”, said John.